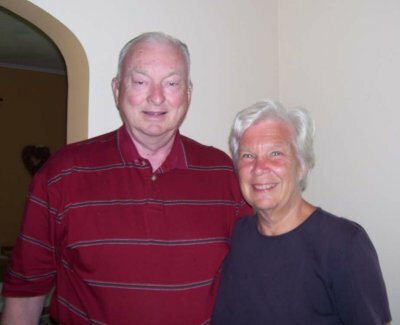 Meet your neighbor, Pastor Tom Wright and his wife, Luanne. Tom is the new preacher for the La Harpe, Terre Haute, and Durham United Methodist churches. The Wright's moved to La Harpe on August 1st. Tom was born and raised in Waukesha, Wisconsin. Luanne lived in Whitefish Bay, Wisconsin until she was 13 and then she moved to Pewaukee Lake, Wisconsin. She met Tom on her first day of classes at her new school. She sat behind him in Biology class. Tom and Luanne graduated from Waukesha High School in the same class. After high school Luanne attended college at Denison University in Grandville, Ohio, graduating with a Bachelor of Science in Sociology. Tom attended Carroll College in Waukesha, Wisconsin, graduating with a Bachelor of Science in Philosophy. He then did some graduate work at New York University. In New York he met up with Luanne, who was working there at the time, and they started dating. Luanne and Tom were married in April of 1967. They have been married for 40 years. He was there from 2002-2007. Luanne has been a stay at home mom most of her married life, raising their four children: Andrea, Brian, Dawn (Dion) Olson, and Sarah. They have two grandchildren, Arilyn and Austin. In her spare time Luanne enjoys gardening, reading, and traveling. Some of her favorite places she has been are Europe, Italy, and Northern Wisconsin and Michigan. Tom enjoys traveling also. He likes going house boating on the Mississippi River and watching spectator sports. Two of his favorite teams are the Packers and the Cubs. The Wright's a have only been here for two weeks and people have been very welcoming, friendly, and gracious. Tom says, "I can see this community has pride and great local leadership and I'm excited to become a part of it!"